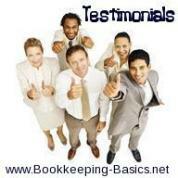 You have found the testimonials from Bookkeeping Basics and Horne Financial Services visitors and subscribers. Also, please feel free to share your very own story to help me learn more about your wants and needs and whether or not I am meeting them. As well as to spread the word about bookkeeping-basics.net and Horne Financial Services. Thanks so much for your insight and consideration! Have A Great Story About Your Experience with Bookeeping-Basics.net? Are you a bookkeeping or income tax client? Do you have a great story about the experience you had working with me? Share it! Thank you for taking the time to check out my site and services by reading the accounting, income tax and bookkeeping reviews found here at Bookkeeping-Basics.net. I take pride in giving you the assurance that the personal assistance you receive comes from years of advanced training, technical experience and financial acumen. I take the feedback I receive from you seriously, and take it to heart. Thank you again! If you have enjoyed reading the accounting, income tax and bookkeeping reviews about Bookkeeping-Basics.net and Horne Financial Services, you may also be interested in reading some of our product reviews. New product reviews are always being added on things such as QuickBooks accounting software, home financing software, bookkeeping supplies, income tax products, and other miscellaneous business products. CLICK HERE to see read some of our product reviews.